Have you ever seen a dog that was happy to get his teeth brushed? 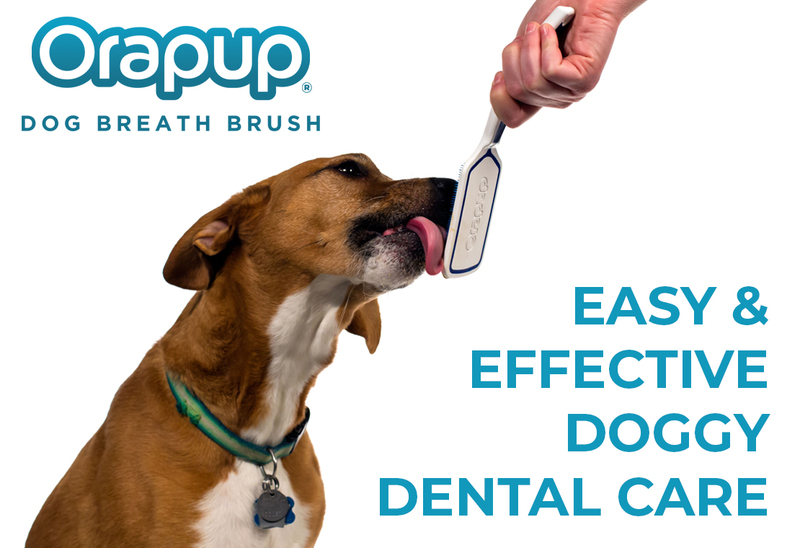 Well, now you can promote a healthy mouth and get rid of stinky dog breath the easy way! Orapup Lickies is a natural gel with enzymes that fight bad breath and have anti-plaque properties. The “brush” is designed to remove bad breath causing bacteria from your dog’s tongue while the dog licks his way to clean teeth and gums. With Orapup and Lickies cleaning your dogs tongue is a treat, not a chore because your dog does all the work. Lickies are a treat they will LOVE! -Includes 1 Beef & Bacon 2oz bottle of Lickies gel and 1 Orapup Brush (green). Apply approximately 1/2 tsp. of Lickies onto the surface of the Orapup. Allow your dog to lick for one minute, or more if you desire (some Lickies residue will remain in the bristles). When finished rinse Orapup with water and store out of reach of dog. For best results use once daily. Replace your Orapup every 90 days to prevent bacteria build-up.